As you could probably already tell from his Amano artwork, Setzer Gabbiani is kind of just awesome and entertaining. Well he is actually quite an intriguing character looking past his reckless, gambling, thrill-seeking outward appearance. Setzer at a younger age was pilot with a slight gambling problem. A girl named Darill had an airship, the Falcon, that he wanted his hands on. Setzer and Darill would always compete with the Falcon on the betting table, but Setzer would always come back. One time Darill told Setzer that if her reckless nature ever made her unable to fly the ship was his. This basically put Setzer in shock making him realize that he cared a lot for her telling her that her crashing would never happen. Well it does. Setzer buries her and her ship underwater and gains his present reckless nature from this event. In the present day of the game, Setzer has his eyes on the Opera singer Maria, and makes himself utterly infatuated with her. The Returners at the time end up at the Opera house needing a pilot and airship and devise a plot to get his help. They learn that Setzer was going so crazy about this girl that he was about to kidnap her so, Celes disguises herself as Maria and takes her role in the Opera. In one of the greatest musical and comedic moments of the game, A boss (more specifically a giant octopus) returns out of no where to make even more trouble. He is comedically tossed to the side, and Setzer kidnaps Celes, still thinking it’s Maria. He soon discovers that it is Celes, and that he’s not even upset because he finds Celes more attractive. The party arrives on the airship and Celes takes Edgar’s double-sided coin saying that if he wins he gets her hand, and if she wins, Setzer will pilot the party. In the most classic “I’m not even mad, just impressed” manner Setzer joins the team and becomes their pilot. These people over the course of the next events of the game become his close friends, and you can assume some of his scars heal. 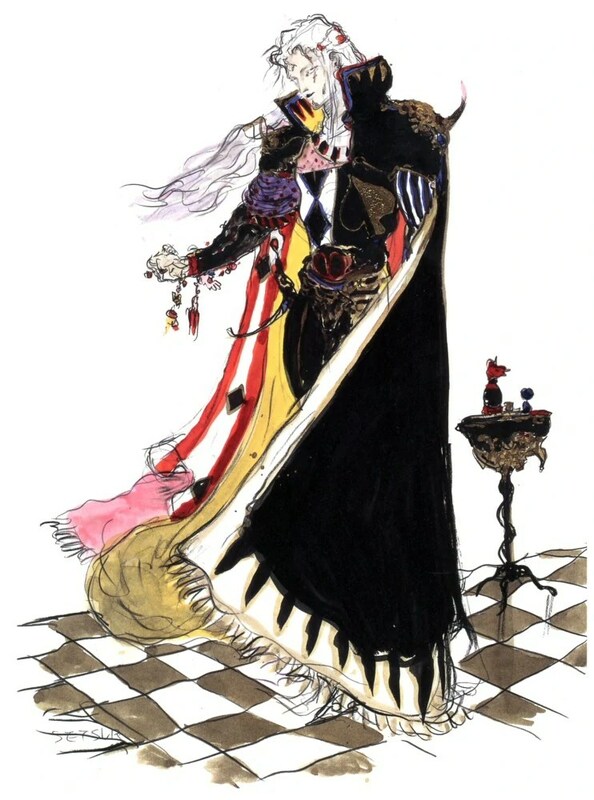 Then the end of the world happens because Kefka is the best villain ever. Having being this shaken up by such great loss twice, Setzer can be found wasting his life a way at a bar in the end of the world. Celes convinces him to keep fighting, and the party ventures through Darill’s tomb to obtain her airship, the Falcon. I really like this Amano artwork for Setzer. In this artwork, just looking at his eyes gives everything one would need to know about his reckless nature and search for risk. The excessive amount of gold, big capes, and general expensive items shows how much time he really does spend in gambling (as he is apparently pretty darn good at it). The sprites of Setzer on the other hand seem to show his real nature–what pushed him to be so reckless. His sprites really portray him as being super focused and serious, when a lot of his words and actions don’t show this at all. This really shows the extra depth behind his character, as Setzer really DOES care, even if it doesn’t always seem like it. Setzer’s Theme is another multipurpose theme with the normal AB form. It is mostly comprised of a very fast moving descending cello/bass/tuba line, violin harmony and counter-melody, and his theme played in a fanfare like manner on a trumpet (with a close harmonic counter-melody to this on a french horn). This fast moving low line really expresses the whole keep-moving-to-distract-yourself mentality behind Setzer, while the Fanfare is describing all the actions he is doing the distract himself. When the B section arrives the low line slows down into a more harmonic function, and the Violin and high brass switch roles making the Violins have a melody. This instrumentation change is a great way to show the deeper side of Setzer without really distracting this song from it’s function, the main theme played in the airship’s deck. Putting the pilot’s theme and the theme of the airship’s deck was really a great way to show how they are both a part of each other. One other thing that I recall being a great use of leitmotif with Setzer, is in the exploration of Darill’s tomb. His theme is modulated into a minor key and can be heard much slower in the song “Epitaph” when he is reminiscing Darril.